Every year, I go to a fashion workshop at the Fashion Institute of Technology (FIT) to learn about the different aspects of fashion. Now, deciding what to wear may seem easy, because I would just wear what I usually wear, right? Well, not exactly. It's actually a lot of pressure (for me) because I'm going to be surrounded by people who all have a similar interest in fashion and I'm sure they are going through the same thought. My process of picking out an outfit may be different than most, but what I like to do is take everything out of my closet to give me a chance to see what my potential options are. My motive for the week in NYC is to dress "differently". When I say different, I don't mean wearing something out of my comfort zone, I just mean something that I may be wouldn't wear on a regular basis or something that not many other people would think of. By the time I get all the clothes out, there is dozens of outfits laying on my bed. 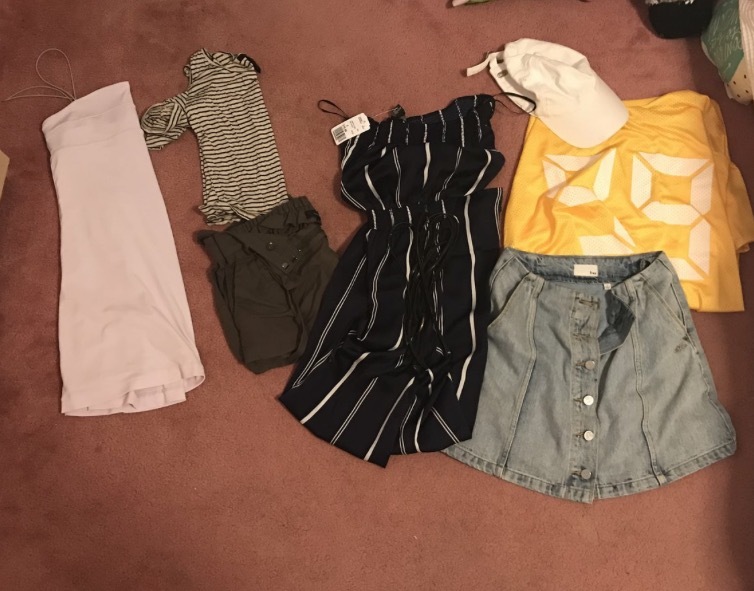 Then I sort through what I could see myself wearing for that week, which would seem easy to do, but it's actually not because I have to go from 16 outfits to only 4. I do my process of elimination thinking about which ones I have worn to much or in previous years and taken a lot of pictures in. After going through that, I have eliminated 3 things, leaving me with 13 outfits.... for 4 days! Next, I look at what I may have too much of. If you look in the picture, I have alot of denim. I may try to eliminate a couple denim pieces, so I can have an assorted look (refer back to my Five Friday Favorites: what to pack for NYC post). Going with the idea of "different", I want to keep a denim piece that I think could be different. I decided to take away the denim shirt on the upper left hand corner because it was long sleeved, so I may be too warm. I also decided to take away the short denim dress with the white flowers at the bottom because I have a lot of short dress options to choose from. Now I have 11 outfits. Notice how I have two turtle neck shirts on the top, I decided to take away the grey one on top of the skirt because I already have a lot of shirt options for that skirt. Now I have 10 outfits. Now notice how I have two striped shirts, one with the turtle neck and one with the cold shoulder. I would go with the one that is A. more comfortable and B. more trending. Since the colder shoulder trend is still here, I'll go with that shirt. Now I have 9 outfits. I have two army green colored dresses on the bottom. It was difficult for me to choose between these two because they both are similar but different. I decided to go with the romper more to the left because I could do more with it. The right dress also has the similar characteristic of the fringe at the bottom as does the denim midi dress all the way at the bottom left. Now I have 8 outfits. Going to the top right, I have to choose between the yellow penny and the white silk top. I chose the yellow penny because it goes with my "different" look and I had already planned to wear it somewhere that I never got a chance too. That leaves me with 7 outfits! I also decided to take away the army green romper because I could wear it somewhere else and it could be a potential outfit to another event I go too. That leaves me with 6 outfits left. Now, this part is hard because everything is different from each other. At this point, I have to think of any activities that I may be doing afterwards. I decided to go with the striped jumpsuit as an option because it is my new one and I have yet to wear it anywhere. I could also eliminate one of the two dresses and one of the two skirts. I think that since I'm already going to wear the jumpsuit, I'll take out the maxi skirt on the bottom left. I also decided to go with the pink dress to the right because it's a light color and I don't have any light colors in the wardrobe of the week. After all that process of elimination, I finally picked out my final four outfits! I hope that if anyone else out there is a stressed out outfit planner like me that reading this will help you get through it! 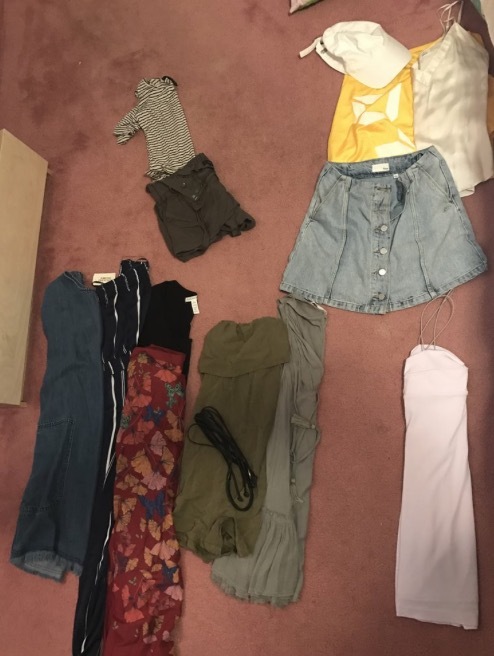 Although it's clearly a big process that takes a long time, this technique has always helped me plan out my best outfits!